Plus, this example issigned on the front cover by one of the authors, D. Pennington.Loaded with great reference content.Full of history and can help you identify authenticity and background. 50 PAGES-The All New Teach Yourself To Knit Evie Rosen Leisure Arts Leaflet 623. Binder shows minor dirt and rubbing. I try to describe everything thoroughly and take pictures of any and all flaws. They are pre worn unless otherwise noted. Note: From the Estate of a Lifelong Singer Employee. Center Color Choosing Chart was Removed from Used Guide- see pictures. We'll Answer ASAP. 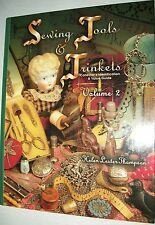 4 QUILTING BOOKS "BAZAAR PATCHWORK" "ENCYCLOPEDIA OF DESIGNS" "QUICK COUNTRY"
I HAVE SEVERAL MORE LOTS OF NEWER COOKBOOKS, SEWING AND QUILTING BOOK TO LIST NOW. Condition score Hurts to think about it=1. We do not repair, repaint or heavy clean our estate finds. This hardcover 11 1/4" x 8 3/4" with 160 pages is in NM (9) condition. Really Trashed=2. Poor (P)=3. Towels, Needle Arts, Lovely Linens, Crochet and Filet Crochet, Flowers, Accessories, Bedspreads and so much more! There are, however, 2 patterns inside for potholders! Looks to be from the 1950's. 22 pages, softcover; full of wonderful retro patterns throughout! ITEM: SINGER Dressmaking Guide (2). Note: From the Estate of a Lifelong Singer Employee. We'll Answer ASAP. 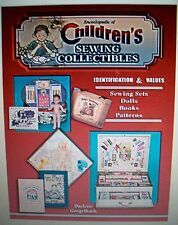 LOT OF NANCY ZIEMAN SEWING BOOKS "10-20-30 MINUTES TO SEW" "BEST OF" "EXPRESS"
THIS LOT INCLUDES 4 FROM NANCY ZIEMAN, RANGING IN DATES FROM 1992 - 1994. 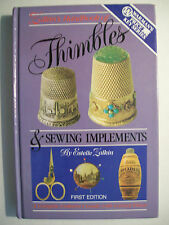 I HAVE SEVERAL MORE LOTS OF NEWER COOKBOOKS, SEWING AND QUILTING BOOK TO LIST NOW. LOT OF QUILTING BOOKS "SUPER QUILTER II" "QUILTS OF AMERICA" "MORE LAP QUILTING"
Very Good Condition - There is a small tear on bottom corner. See last picture. Overall condition good, coloration due to age. See photos for details. 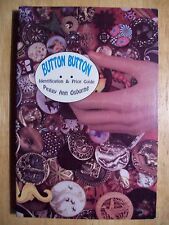 LOT OF NANCY QUILTING BOOKS "FINE PATCHWORK" "COUNTRY QUILTS & SOFT FURNISHINGS"
This is the most informative book available for the collector of buttons, written by a second-generation collector who has traveled the world over to expand her knowledge of this exciting collectible.